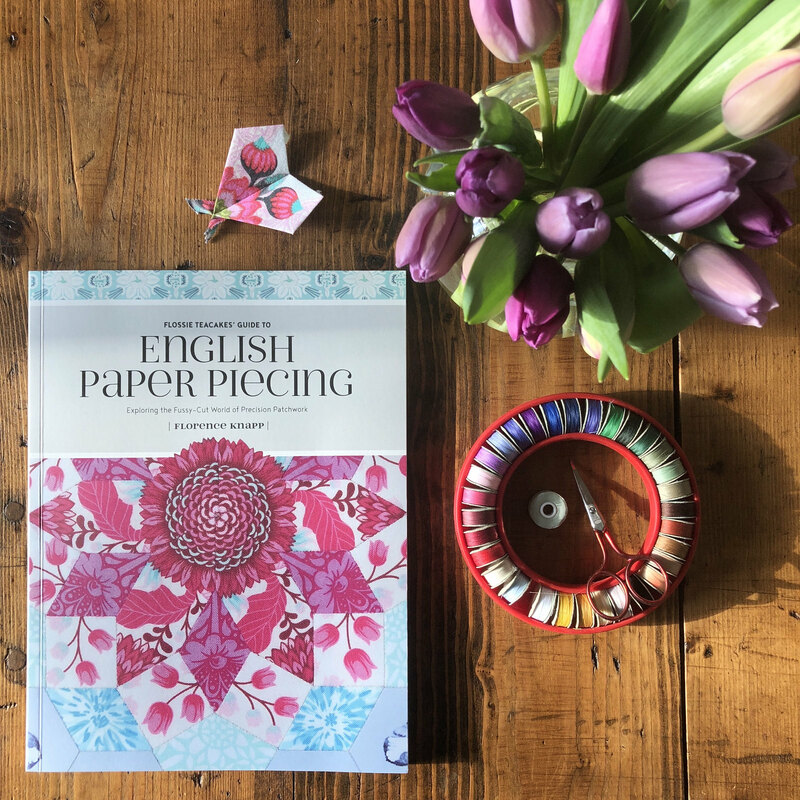 I wanted to write one final post to end the year, mainly sharing the books I've most enjoyed reading, but also a brief sewing-related round up, as I've sewn a lot this year, but have somehow failed to document a lot of my finishes. I often put off sharing a finished photo on Instagram until I've posted about it here on my blog, but with just 21 blog posts written in 2018, there's quite a backlog...I possibly need to find a different system for 2019. Anyway, my year began with English paper piecing and has come full circle to end with it, via a detour into piecing with a running stitch. 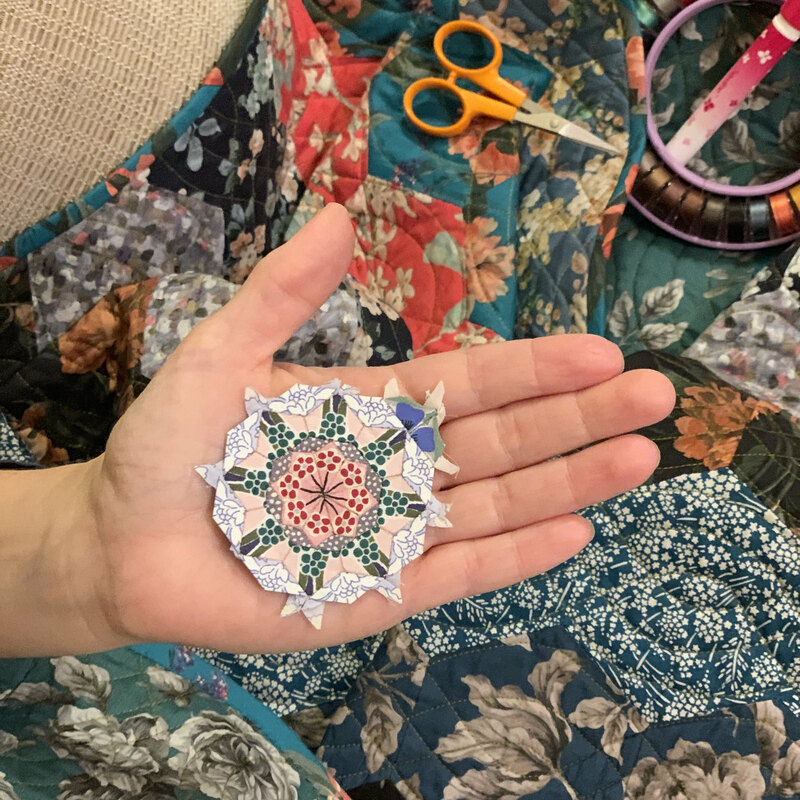 Over the holidays, I've been working on a second miniature version (you're yet to see the first here; to follow, I promise!) of The Ripple Effect pattern from my book and have enjoyed getting up early and coming down to the living room to work on it before anyone else gets up for the day, hence the artificial light in this taken-while-it-was-still-dark photo. 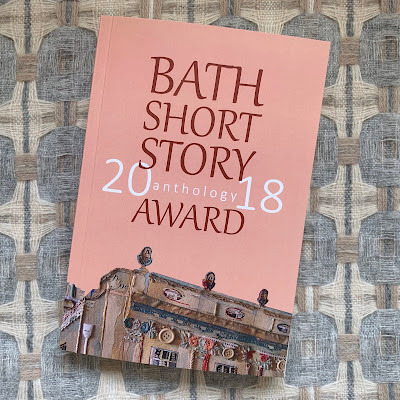 In many ways, 2018 has been a wonderful year for me - my book on English paper piecing was released, and I also had my first piece of fiction published in an anthology after making the shortlist, and then winning the Acorn Award given to an unpublished writer of fiction in the Bath Short Story Award. 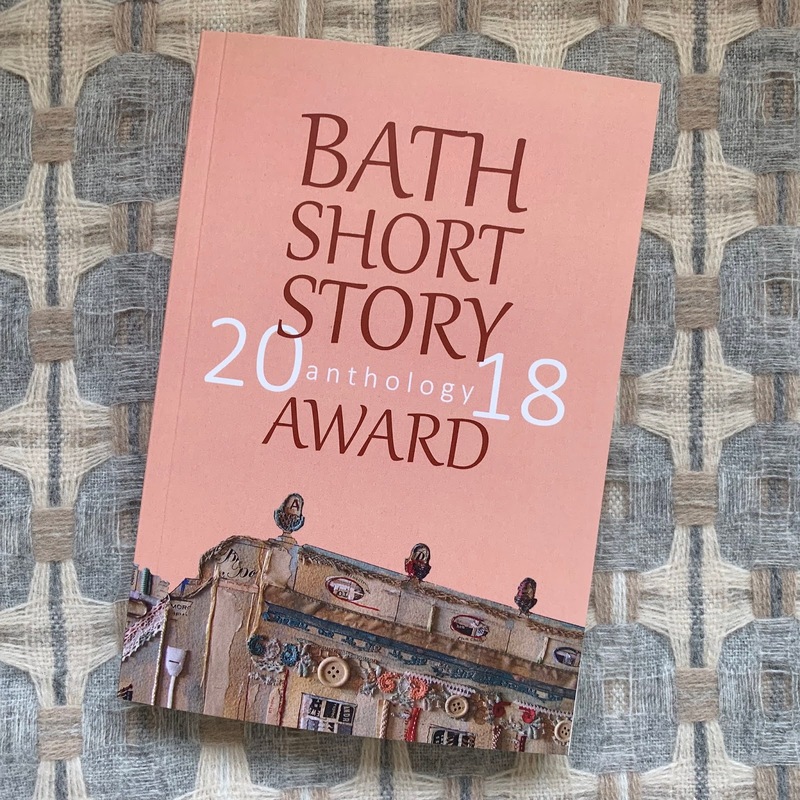 It has been my longest-held dream (pretty much since childhood) to write and have that writing published, so both of those things felt magical to me. But despite lots of wonderful things, 2018 has also been a hard, bleak year for me, dealing with things that were, and still are, largely beyond my control. I'm trying to muster that 'fresh new sheet of paper' feeling about the coming year, but my experience of the last one is that sometimes you don't get a choice about the paper laid out before you...the only thing you have any control over is your response to the inkblots and trying to salvage the space that remains between them for joyfulness. That's not a new experience, but I think my optimism for laying out a fresh sheet of paper is somehow feeling more dented this year. Either way, that old adage of Jane Brocket's about preferring to leave personal things to be discussed around the kitchen table, rather than on a blog, is one that has always felt very true for me, but in the interests of authenticity, it feels important to acknowledge, albeit vaguely, that life has felt far from shiny this year. Elinor Oliphant is Completely Fine, Gail Honeyman - This came recommended to me by Kerry at the start of the year and it's a book that I've carried with me and is still a favourite nearly twelve months later. It's a story that manages to be simultaneously both funny and heartbreaking with a deliciously eccentric heroine. This is the Story of a Happy Marriage, Ann Patchett - Given me last Christmas by my father, a fellow Patchett fan, this is a collection of her essays. which have previously appeared in newspapers and magazines. All wonderful. A Spool of Blue Thread, Anne Tyler - I adore Anne Tyler's writing - she has a way of creating very ordinary, almost dull, characters and then making the reader care deeply about what happens to them. I think I've read five or six of her books and this is by far my favourite. Despite the title, there's no sewing involved. I Know Why the Caged Bird Sings, Maya Angelou - How had I got to 41 without reading any Maya Angelou? She is a magician with words, writing about the most gruelling subjects with a lyricism that blows me away. The Tattooist of Auschwitz, Heather Morris - This book was inspired by a Holocaust survivor's story relayed directly to the author, and it's perhaps a will to stay faithful to his account that means it's a story told with little to soften the very factual, sparse writing style, despite it being marketed as fiction. It is gruelling and horrifying, but the central character has a relentless optimism that made it feel easier to read than it might have done otherwise. A Fine Balance, Rohinton Mistry - I'd implore you not to be put off by how thick this book is - it's a magnificent read filled with wonderful characters set in 1970s India (and for dressmakers, tailoring work features quite heavily in it). It's not a happy book in terms of what happens to those characters, but there's a joyfulness to their experience of life all the same and I loved it completely. This would make it not only into my favourite books of 2018, but of all time. Little Fires Everywhere, Celeste Ng - I also read Celeste Ng's Everything I Never Told You this year, but it's Little Fires that makes it into my favourites list. Celeste Ng is one of my favourite writers - I love the way she draws characters, the way she writes about their creativity, and the insights she gives about the way families work. An American Marriage, Tayari Jones - This comes near the top of my list of favourites, with wonderfully complex, likeable characters and a compelling storyline. A Place For Us, Fatima Farheen Mirza - I love books that follow the same family through several decades giving you a sense of why people become who they are and how their experiences shape them, and this does that wonderfully. The Invention of Wings, Sue Monk Kidd - I only discovered Sue Monk Kidd this year and then read two of her books back to back and loved both. Set in the deep south of America, it's a story of both slavery and humanity. 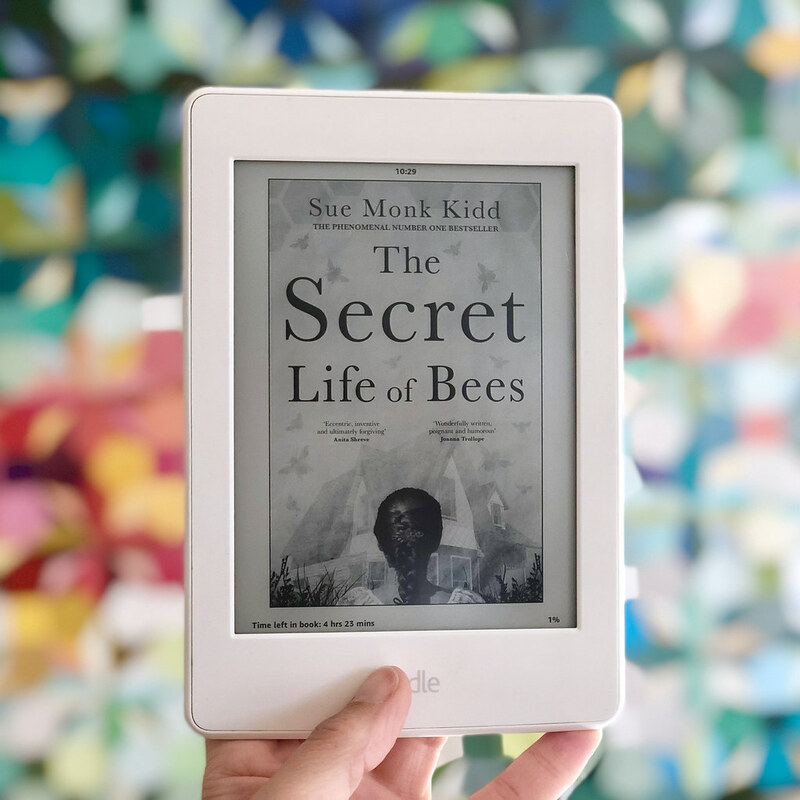 The next book I read by her, The Secret Life of Bees, I loved even more - the writing was delicious and, even though it tackles difficult subjects, I found there's a warmth and glow to the characters and sense of place that made me feel as though I'd been transported into a honeyish cocoon. The Kite Runner, Khaled Hosseini - Khaled paints a wonderfully vivid picture of the landscape and culture of Afghanistan - I felt completely immersed in it as I read. It's a beautiful and painful story of regret, brutality and, ultimately, redemption. Becoming, Michelle Obama - I listened to this as an audiobook and am so pleased I did. Michelle reads it herself and I loved her voice almost as much as I loved her and her story. Educated, Tara Westover - The memoir of a highly unconventional, at times abusive, upbringing and Tara's incredible determination to get herself out of the situation and ultimately become educated. I enjoyed it hugely, although found some bits of it tricky; although I have little sympathy for them, it feels a very exposing book for her family when the events within took place relatively recently. Behold the Dreamers, Imbolo Mbue - The story of a couple from Cameroon trying to build a better life in America. The characters are all wonderful and highly believable and the story raised some interesting ethical dilemmas. Never Let Me Go, Kazuo Ishiguro - I really surprised myself by enjoying this as a large element of it is dystopian (I don't usually like anything not set entirely within the bounds of reality), but Kazuo writes about things with such realism and somehow dances around the dystopian elements without going into too much detail to explain them, that I found I loved it. I then read his Booker prize-winning novel, The Remains of the Day, which I also enjoyed, but not quite so heartily. Elino Oliphant is one of the next books I'm reading with my bookclub so nice to know that's one to look forward to! One of the books we all enjoyed this year is "A man called Ove" by Fredrik Backman. I think you may enjoy that one as well. I found it a truly charming story that I kept thinking about for awhile after finishing it. I would recommend What Alice Forgot. Interesting to think how our past selves might feel about our current selves! I have saved your list for when i am in need of a good book. I also loved Elinor Oliphant. Happy new year! Let's hope for a better one. I loved Eleanor Oliphant is Completely Fine and read it after seeing you mention it on instagram. I enjoyed Dear Mrs Bird and the keeper of lost things, most of my 'reading' is done on audable while I am working and walking the dog. Just finished Circe an interesting one and only read as it was for book club and glad i did. Thank you for your recommended book reads Florence, I have read a couple but will try others, I also am an avid reader. I hope this next year will be a better one for you. I do so enjoy your blog and have just started looking on instagram so will search you out. Thanks for your book suggestions. I've read and loved many of them so I know we have similar taste in books. I'd recommend several authors: Rachel Cusk, Miriam Toews, Ann Mah, Lisa Jewell. Also, try "Girls Burn Brighter" by Shobha Rao. I promise it will haunt you.